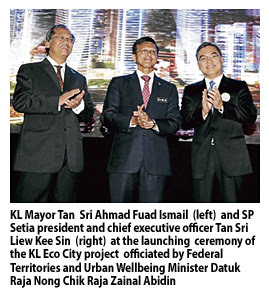 SP Setia Bhd will kick-start the first phase of the RM6 billion KL Eco City project by as early as next year. The first involves the building of RM2 billion worth of high-rise residential units. The company's plan for the project received a boost after it managed to secure RM460 million financing facilities. "We have started works. We are doing soil testing, piling works and so forth," SP Setia president and chief executive officer Tan Sri Liew Kee Sin said. The project, which has a total gross development value of RM6 billion, is expected to take 10 years to complete. The first phase will take about three to four years. It is a joint-venture project between SP Setia and Kuala Lumpur City Hall. "The KL Eco City will be our biggest property project in Kuala Lumpur," Liew said at a media briefing after the signing ceremony for the syndicated Islamic financing facility and launch of KL Eco City yesterday. Also present at the launch was the Minister of Federal Territories & Urban Wellbeing Datuk Raja Nong Chik Raja Zainal Abidin. The facility is provided by three Islamic financial institutions, namely HSBC Amanah Malaysia Bhd, Hong Leong Islamic Bank Bhd and Bank Muamalat Malaysia Bhd. Although the development of the property may raise concerns of oversupply of high-rise residential properties, analysts remain optimistic that the project will have a good start. "There will be demand for the property ... the location is very strategic. I believe the only concern buyers may have is traffic congestion on that area, even that, I believe works are being done to address it," said Mercury Securities head of research Edmund Tham. SP Setia will be investing more than RM150 million to build dedicated interchanges to directly link KL Eco City to all major expressways coupled with an internal two-tier road system. "It's also part of our commitment to solve the traffic problems first, so that by the time phase one is ready, traffic problem of that area will be resolved already," said Liew. Meanwhile, Liew said SP Setia is waiting for the offer documents from Permodalan Nasional Bhd (PNB) for its shareholders to decide whether to sell their shares to the country's biggest fund manager. He ruled out the possibility that SP Setia would convene an extraordinary general meeting to discuss the PNB takeover bid as reported in a newspaper. "There will be no such meeting. It's all lies. It's in the shareholders' hands whether to sell or not to sell (their shares)," he added. KUALA LUMPUR: SP Setia Bhd Group is awaiting offer documents from Permodalan Nasional Bhd (PNB) for its shareholders to decide whether to sell their shares to the country's biggest fund manager. President and chief executive officer Tan Sri Liew Kee Sin said sentiments aside, his company was still positive on the bid to increase PNB's stake in SP Setia. “On the positive side, the company was very proud that a national and the largest fund manager is prepared to increase its interests in SP Setia and also boost the company's value. “If SP Setia is not good, an entity such as PNB will not come forward to invest more.“Whatever it is, we must still wait for the official offer documents to come out,” he told reporters after the launching of KL Eco City project by Federal Territories and Urban Well-Being Minister Datuk Raja Nong Chik Raja Zainal Abidin yesterday. Liew said the acquisition process was long and complicated, but the official offer documents should come soon, maybe by year-end, subject to PNB's convenience. Asked whether he would helm the management after PNB held majority shares in SP Setia, Liew said he would if asked to. “However, until this moment, our (SP Setia and PNB) relationship is very good,” he said. Liew also ruled out SP Setia would convene an extraordinary general meeting to discuss the PNB takeover bid as reported in a newspaper. “There will be no such meeting. It's all lies. It's in the shareholders' hands whether to sell or not to sell (their shares),” he added. HONG KONG: IJM Land Bhd's RM5 billion iconic waterfront project in Penang, known as "The Light," is up for grabs at the ongoing MIPIM Asia 2011, the world's premier real estate exhibition and conference, at the Hong Kong Convention and Exhibition Centre. Located just off the Penang Bridge on the island's eastern coastline, The Light is an integrated project comprising commercial and residential components. Its chief executive officer and managing director Datuk Soam Heng Choon said: "We are bringing it up to Hong Kong (at MIPIM Asia) where there are more international investors who are looking at it. "The residential component is on 16.8ha (42 acres) reclaimed land which we launched in 2009. Currently, we've launched four parcels of the residential projects. "We already commenced reclamation for the commercial projects. We are now ready to go into the market to look for investors," he told BERNAMA on the sidelines of MIPIM Asia 2011, here. MIPIM Asia 2011, which began yesterday, was opened by Hong Kong's secretary for development, Carrie Lam Cheng Yuet-ngor. The three-day event will end tomorrow. In the commercial component, Soam said the total land hectarage was about 42 hectares (105acres) comprising hotels, a business park, convention centre, shopping complex and a performing arts and cultural centre. He said the first phase of the residential component was under construction. "We've launched (the residential component) and was mostly sold to Penangites. "This project will take 10 years (to complete). This, however, depends on how fast we can go. If we can get investors to come in to partner us in some of the commercial projects, this can go very fast, may be in the next five to eight years, it will be completed, he said. Soam said IJM Land was not desperately looking for investors, however,"we are just looking for people who may be interested because we've already got a lot of interest and investors who are already there but there may be additional people who are also interested as well." Back home, he said: "We've our local and also Singaporean funds looking at investing in this place as well." "We came here to specifically network and showcase The Light project. So, we need to be more focused and today we are here to focus on The Light," he added. IJM Land, with projects in Penang, Klang Valley, Johor, Sabah (in Kota Kinabalu and Sandakan) and Sarawak (Kuching), is among the Malaysian participants at MIPIM Asia 2011 being held at the Malaysian Pavilion. The Malaysian Pavilion was initiated by Malaysia Property Inc, a Malaysian government initiative that acts as a "bridge" between institutions and corporate and private investors to real estate investment opportunities in Malaysia. KUCHING: Ibraco Bhd is to aggressively expand its property development with the purchase of 49.5ha of prime land along Kuching-Kota Samarahan Expressway for RM41.6mil in cash. Managing director Chew Chiaw Han said the land acquisition was a strategic move in line with the group's expansion and development plans. “The said land is a strategic investment which will help to enhance the group's future earning potential,” he told StarBiz. Ibraco, which has built more than 10,000 units of properties mostly in the Tabuan Jaya area here, expects the acquisition to be completed within 60 days. The purchase will be funded by internally generated fund and bank borrowings. Chew said the acquisition had boosted Ibraco group landbank to more than 404ha in Kuching. Ibraco said the vacant land was strategically located in the greater Tabuan Jaya with good existing infrastructure and easy accessibility to public amenities. It is sited near to Ibraco's most ambitious flagship development Tabuan Tranquility, a massive commercial, industrial and residential project on 66ha which had registered high take-up rates since it was launched last year. The 49.5ha land has been approved by the Sarawak Land and Survey Department for mixed development. “We are in the midst of drawing up a development masterplan for the vacant land. “First phase development is expected to kick off in the first half of 2012,” he added. The land is expected to be developed in phases, and would probably comprise commercial, office and residential properties. As of Sept 30, Ibraco has sold all 76 units of four-storey shophouses under Tabuan Tranquility phase 1 and 81% of residential properties (204 units of terrace houses and 38 units of semi-detached houses) under phase 5. Tabuan Tranquility will have 640 units of double-storey terraced houses, 108 units of semi-detached houses, 60 units of three-storey townhouses, 76 units of shophouses, 72 units of semi-detached industrial buildings, one office block and a petrol service station when fully developed in five phases by 2015. The mixed development has a gross development value of RM517mil. Two months ago, Ibraco launched a new residential scheme in Tabuan Stutong Jaya, which comprises 77 units of single-storey terraced houses and semi-detached houses. It is also building a block of eight three-storey shophouse in Stutong. “The group continues to post strong sales momentum for all projects,” Ibraco said in notes accompanying its third quarter (Q3) results. Ibraco posted a group pre-tax profit of RM3.2mil on turnover of nearly RM27mil for the quarter ended Sept 30, 2011 against a group pre-tax loss of RM2.14mil on turnover of merely RM72,000 in the Q3 of 2010 when it was still categorised as a Practice Note 17 company. For the first nine months this year, the group registered pre-tax profit of RM10.8mil on revenue of RM74.9mil. WASHINGTON: The reach of a government effort to help distressed homeowners refinance their mortgages could be largely determined by details on lender liability that will be announced. The regulator for government-controlled mortgage finance firms, Fannie Mae and Freddie Mac, said last month that it was widening a programme to help borrowers with little or no equity in their homes refinance. The initiative, known as the Home Affordable Refinance Programme, or HARP, hinges on lenders voluntarily writing new loans for borrowers hard-hit by declining home prices. But many lenders have been worried that they could be forced to buy back refinanced loans if defects with the initial mortgage are found, a concern that has undercut the programme's effectiveness. The regulator, the Federal Housing Finance Agency (FHFA), said it would relax the representations and warranties participating lenders had to abide by as part of its revamp of the programme. Lenders would have learnt yesterday to what extent those contracts, which determine their liability for bad loans, will be waived. HARP is open to borrowers who have little or no equity in the homes as long as they are making timely payments and their loans are guaranteed by Fannie Mae and Freddie Mac, which currently back about half of all US residential loans. As part of the revamp announced in October, FHFA said it would scrap a cap that prevented borrowers whose mortgages exceeded 125% of the value of their homes from participating in the programme. Analysts at Barclays Capital estimate up to 3.1 million loans are eligible for the programme. So far, about 894,000 borrowers have used HARP to refinance. FHFA said the changes could double that number, although that would still fall far short of the five million homeowners the Obama administration had hoped to reach when the programme was unveiled in 2009. While borrowers may move through the refinancing process at a faster rate under the retooled initiative, the breadth of the waivers on representations and warranties will largely determine the degree to which lenders and mortgage servicers are willing to make these riskier loans. Those originating the loans have been skittish about refinancing higher-risk borrowers with the possibility a loan's government guarantee could be stripped if it sours or it is deemed defective. Edward DeMarco, acting director of FHFA, said during a conference call with reporters last month the plan would wind up producing “substantial relief” from the representations and warranties. But George cautioned that Fannie Mae and Freddie Mac might try to offset the waivers with an additional fee to cover the potential costs of being stuck with bad loans. The companies have been successful at getting lenders to buy back defective loans, which has helped them bring in revenue.